The Legend of Zelda: Twilight Princess is the latest amazing game in this fantastic franchise. A mysterious dark figure has emerged from the Twilight Realm into the world of light. Playing as Link, you must travel through dark forests, maze-like dungeons and far-off lands of Hyrule, trying to unravel what has happened and to restore order to a now broken land. This is a single-player story-based game, where you travel through lands, face challenges, and solve puzzles as you progress. The first part is easy - choose a name for yourself (I stuck with Link) and your horse, and then into the game you go. You start off with 'simple' challenges to help you learn the controls, and figure out how things work. But nothing is really that 'simple' - even with the help from other characters telling you where to get the fishing rod, for example, you have a fair amount of thinking and figuring out before you can actually get it. Challenges relate to one another, too, so you have to solve one to be able to solve the next. This isn't simply running around bashing things - you do have to use your brain, and it's great! 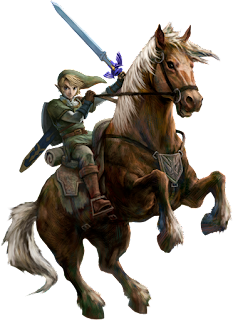 Once you have mastered controlling Link and your horse (including herding goats, jumping over fences, and learning how to use your sword), you are off in the first foray out of the village. Outside is a dark and threatening land, but you have a mission to complete and many adventures lay ahead. It isn't long before things take a turn for the worse, and everything you have learnt to help you play as Link has to be re-learnt as you take on a new form. This is a beautifully crafted game. Nintendo have taken a classic adventure and added a serious and classy style. The artwork is stunning, and the video clips are as enjoyable as they are informative. As well as many helpful characters, there are of course the many characters and figures who mean you harm. In this story, the darkness is quite palpable at times, and the atmosphere electric. For the serious gamer, and anyone who wants to prove themselves, there is a Hero mode, where enemies deal double the damage and health-restoring hearts don't appear. As with other fantastic Nintendo games, you can buy Amiibo's that add new dimensions and features to the game - opening new parts of the game, or (for if you really want to see how tough you are) making the enemies even stronger. If you have ever played a game in the Zelda series (I remember playing the Ocarina of Time many years ago) you will want to play this. If you haven't, well this is a great place to start. It is in-depth, it is immersive, it is challenging, and yes it has a dark plot. But the controls are finely balanced, the gameplay is excellent, the art work is stunning, and the game overall is fantastic. The Legend of Zelda Twilight Princess is available on Nintendo WiiU and is rated PEGI 12. Find out more from the Nintendo website. Our photos really don't do the graphics and imagery justice, and the atmosphere created is so much more intense than can be portrayed in this review - go and enjoy it for real! This was my Easter morning breakfast and it tasted soooo good I needed to keep a note of the ingredients that I threw into it. Just blend together the main ingredients for the smoothie bowl. I use my Kenwood kmix blender which makes light work of this. Then pour into a bowl and add the toppings. It's amazing how just two dates can add so much sweetness. I've been able to cut loads of sugar out my diet lately using the natural sweetness of dried fruit. This makes enough for two people in my opinion but sadly no one else in the family was tempted to have any so it made a very filling breakfast just for me. I didn't want to risk keeping half of it in case the avocado discoloured. My hastily taken photo doesn't really do it justice but it really does taste good! It tastes just as creamy without the double cream so no need to add that. In this version, for the topping I added chopped roasted hazlenuts and pumpkin seeds as before but also cacao powder and fresh raspberries. Coconut oil is truly a super ingredient if ever there was one - with its health credentials and its many varied uses from cooking, to health and beauty, this is one must-have product! My preferred way of using Vita Coco Coconut oil is in savoury dishes - I stir it through pasta, noodles, and quinoa, I roast butternut squash with it, I use it to stir-fry my favourite veggies. Lots of dishes are given a healthy and tasty makeover by using Coconut oil instead of butter or vegetable oil. But with this being Easter season, I have decided upon a sweet recipe rather than savoury for the Vita Coco #SwearByIt challenge. This is a really fun and simple recipe and makes a great alternative to Easter eggs if you get fed up of all that chocolate over Easter. Apart from a bit of melting for the truffle part of the recipe, it is otherwise a 'no-cook' recipe so it is super easy for the kids to join in with. 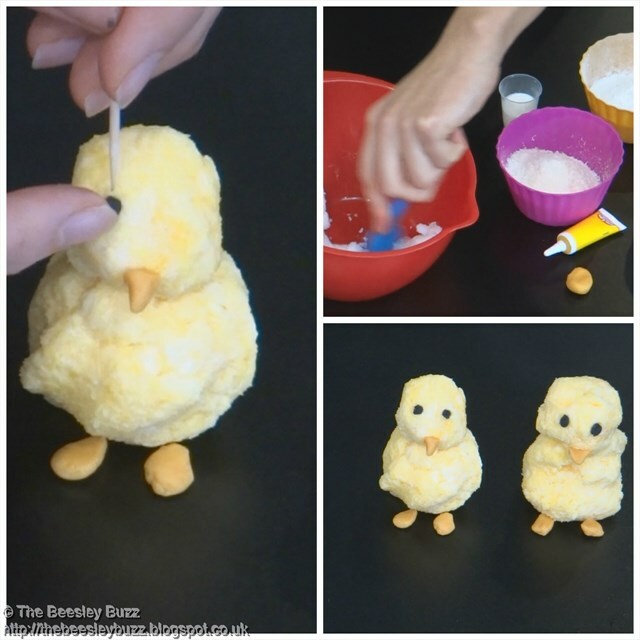 They will love making these cute little Coconut Easter Chicks! I've made a video to show just how simple and quick this recipe is to make and I also show you how to make some little egg shaped coconut and chocolate truffles to go alongside the chicks. Soften the Vita Coco coconut oil by mixing with a spoon. Add in the icing sugar and mix well with the milk. Add the milk very gradually as you may not need all of it. Add in the dessicated coconut and mix with a tiny drop of yellow food colouring gel. Add enough to get your desired shade of yellow. Roll one larger ball for the body and one smaller ball for the head to make your chick. Add the details like the beak and the eyes. Melt the chocolate - I like to do this by breaking the chocolate into a bowl and warming over a pan of water on the hob. Don't let the bowl touch the water. Melt the coconut oil - I did this in a microwaveable jug, in short bursts on low power. Mix the melted coconut oil into the melted chocolate. Then add in the icing sugar and mix well. It will look like a chocolate 'dough'. Pick off small pieces and roll into an 'egg' shape. Roll these 'eggs' into the various coatings to make them look super. Arrange them around your cute easter chicks. 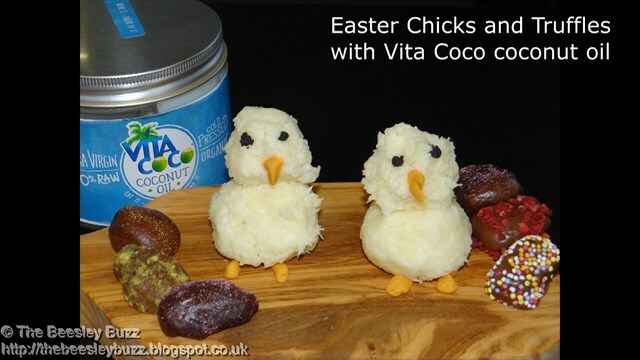 If you like the flavour of coconut, you will love these - The chicks taste fabulous with the flavour of Vita Coco coconut oil mixed in with the dessicated coconut and the truffles are just gorgeous with the coconut oil merging with dark chocolate to give an incredible flavour. Now just as you were thinking these are way too specific for Easter, just think about the possibilities...With a little creative thinking the shape and colour of these tasty coconut treats can be adapted throughout the year. Instead of yellow chicks, how about pink hearts for Valentines day? or keep them white and they would make perfect little snowmen at Christmas. The truffles don't need to be egg-shaped either - and would make delicious truffles anytime of year - perhaps a tasty birthday gift or end of term pressie for the teacher. There are so many brilliant possibilities for this recipe. As it's Easter weekend, for now, we'll enjoy them as these cute Easter chicks. Vita Coco kindly sent me a 250ml jar of Vita Coco coconut oil. All opinions and ideas are my own. 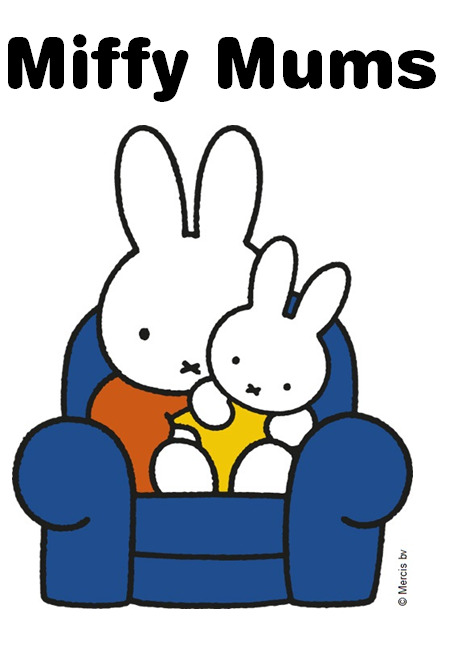 We were thrilled to see the Draw With Me linky return this month to This Mummy Loves. It is a great way of keeping a record of some of the things that the kids draw and make. Otherwise I find I don't have space to keep everything in the house and eventually they will end up going in the bin to make room for new creations. This month's theme is Easter and Miss T has been getting creative with some Easter themed crafts. Her drawings are beginning to take shape a bit more but mainly when she draws she likes to draw treasure maps so they don't have much to do with Easter! Hence here I am showing the craft activity that she is really proud of instead. And next is a daffodil - What I love about this one is how she hasn't been constrained by where the paper ends like an adult would be when drawing or creating art but instead her daffodil just goes off the edges of the paper as it wishes to. The other thing she will happily spend ages on is 'writing'. She does tiny little marks that actually from a distance do look like writing. There are a few letters that she can write properly, T, i, and r for example that she has just picked but she far prefers to do this type of writing. Mark making of any sort is so important at this age so we haven't worried at all about any 'proper' letter formation but just let her enjoy writing anything at all that she wishes to. This time last week I was buzzing with happiness...Miss T had her latest Great Ormond Street appointment and her ultrasound scan showed that her feet had no swelling or abnormality showing. She had complained far less of any pain in the previous few weeks. Her physiotherapist had been really pleased with her progress. She'd been gradually walking further and further distances. We had been able to cut down on the naproxen and then stop using it altogether as the Methotrexate finally seemed to be giving her the pain relief that it was supposed to. We had a plan of action - to continue with Methotrexate injections for another year and then a different type of blood test could be done to help assess whether the actual arthritis had gone into remission by then. Her jaw may need an MRI at some stage but that didn't seem to worry the doctor too much. She was given antibiotics for a chest infection (which our GP had failed to spot the day before) - They promptly kicked in and her cough soon subsided. It had been a difficult week to have her stuck indoors with a high temperature and horrible cough that was preventing her (and us!) from sleeping and was so persistent that it led to her vomitting when she couldn't catch her breath. She had lost her appetite all week but she had kept up her fluid intake so I wasn't too worried about that. And so there we were at the end of the week on a real high in terms of how well she was doing with her arthritis. Then this week it really feels like a case of one step forward, two steps back. She has struggled with walking anywhere - crying out in pain saying 'my feet hurt, my feet hurt'. It seems to be the right foot causing more pain (whereas the worst affected was previously the left foot). She has had to use the wheelchair to cover any kind of distance. I am hoping that she is experiencing pain because we had to miss last Friday's MTX injection because of her high temperature and that once she has today's injection the pain will improve. It is supposed to work over the long term so in theory missing a single dose should not have such an impact but I am hoping that is what it is that has resulted in pain so that it can be put right. And then there was the outbreak of chicken pox at preschool. 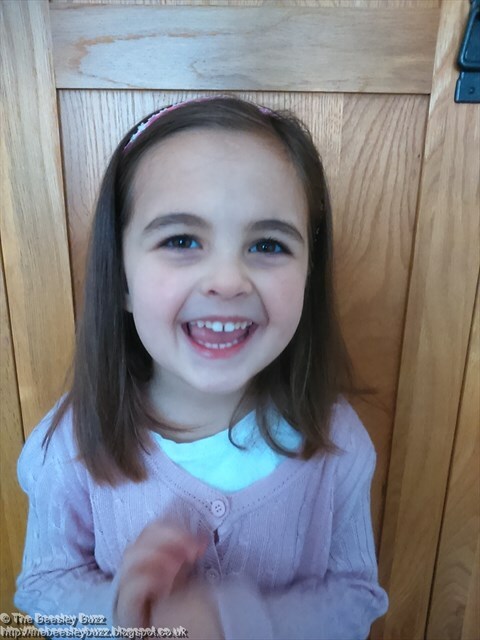 Catching chicken pox can have an extremely serious effect on her whilst she is on Methotrexate. So it was panic stations and calls to the hospital to get immunoglobin / VZIG injection organised which she has had once before and it is horrible - such a huge amount to be injected and really painful for her. Bearing in mind she is used to injections, having them weekly, she is usually incredibly brave. But even for someone so used to injections, this was really horrid. They had to split it between two injections and two nurses had to inject it into her leg muscles at the same time. What we hadn't realised the last time she had this was that this will only cover her for 3 weeks and then it is back to square one. Another contact with chicken pox and she will have to have another VZIG injection. One of the things I'm learning through all this is to learn to be far more relaxed about planning ahead - I am rapidly getting used to all my plans going out the window on a regular basis. We are learning to enjoy and make the most of the good days - the pain free days - the days with no illness or cough or temperature which she is so prone to at the moment. And if she can smile through it all, then so can I. The other day Miss T had a friend over and they did some cooking together - They made what we like to call 'chocolate playdoh'. It is actually a really simple chocolate truffles recipe that is great fun to make with the kids and we've blogged the recipe for it here. I was left with the scrapings of the dark chocolate in the bowl I had melted it in. I noticed that I also had a bowl of leftover popcorn - the remains of a bowl of popcorn I had made for the kids to take in their lunchboxes to school. So I wondered what it would be like to throw the popcorn into the melted chocolate and mix it around and see how it turned out. Really rather good it seems. I spread the chocolatey popcorn out on some greaseproof paper to allow the chocolate to set and we all agreed that it tasted fab and it's a brilliant way of using up those last scrapings of chocolate when you are making another recipe. This new book, created by comic genius Stan Lee, is the first in a trilogy of stories based on the Chinese zodiac. It is written by Stuart Moore, with illustrations by renowned comic book artist Andie Tong. When Disney sent us this book to review we had a dilemma of which of our sons would be most suited to review it (they actually did very kindly send two copies but I like to allocate reviews to each of them so that they can take overall responsibility for it). You see 9 year old D is our comic book fan - he loves reading comics, he loves creating his own comics and he loves drawing comic characters. But this is more than just a comic. Although it is the brainchild of Stan Lee, creator of all those famous Marvel superheroes, the actual book is a novel, not a comic. In The Zodiac Legacy, Steven Lee gets the tiger powers from the Chinese zodiac, enabling him to have super strength and faster reflexes.He then teams up with Jasmine, Carlos and the other zodiac-powered kids to beat Maxwell and the Vanguard. The Vanguard are the group that wants to control the world using zodiac powers. The Vanguard then battle Steven's team to try to drain their powers and use them to control the world. Duane has the power of the pig, allowing him to destroy and tamper with nearby tech. Kim has the power of the rabbit, meaning that she can teleport. Jasmine shares the dragon power with Maxwell, meaning that Maxwell can do the same things as Jasmine and draw the power out of her and into him. Vincent is part of the Vanguard and he has the power of the monkey. He can swing between different obstacles and dodge attacks. I think that it is a great book and I give it eleven out of ten. Wow. 11 out of 10 - what an accolade! There are some brilliant preview pages of the book you can access here on The Zodiac Legacy website. You can see for yourself just how amazing the drawings are and get to know a bit more about the key characters in the story. The Zodiac Legacy is aimed at children aged 9-12 but as Stan Lee himself says: "It's a book that I think children would love, but I think a guy 50, 60, 80, 100 years old would love - anybody who likes a great adventure story about things that are bigger and more imaginative than life itself." 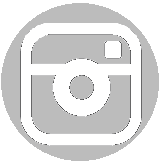 Find out more about The Zodiac Legacy on the website here. Disclosure: We were sent two copies of The Zodiac Legacy: Convergence for the purposes of review. All opinions are our own.